We were thrown into the Back to School routine, and I'm just trying to adjust to the new rigid schedule and stay ahead of the game! One part of the Back to School routine is packing lunches. I'm going to be completely honest. I DREAD packing lunches. 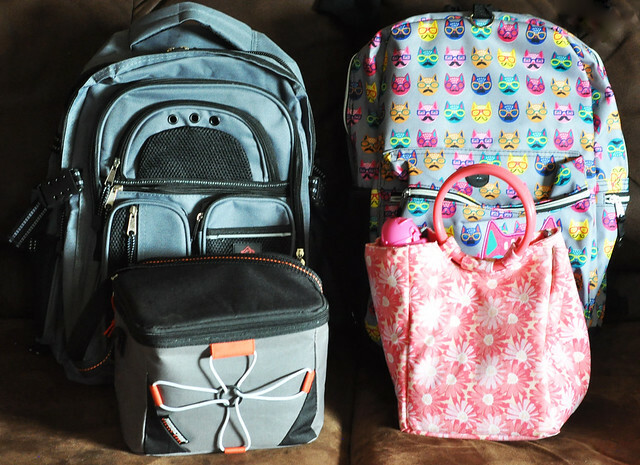 Lexie packs every single day and Dylan packs most days, so it's a must. I'm always looking for ideas to make this chore just a bit more tolerable! 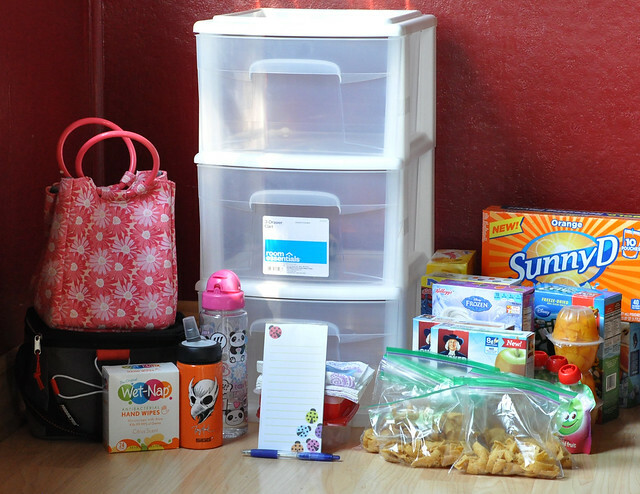 Several pins that kept popping up in my Pinterest feed recently were for lunch packing stations. 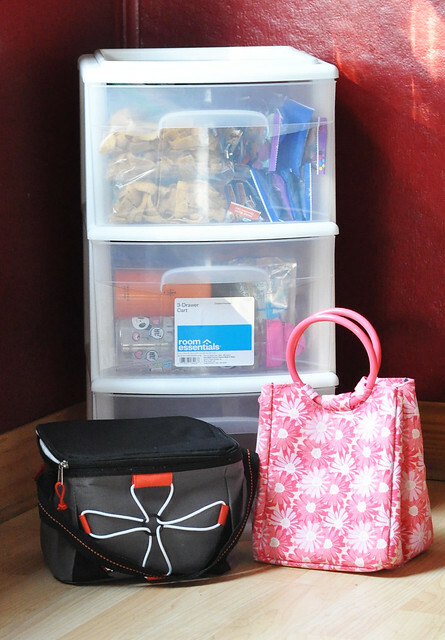 They all involved putting snacks and lunch items in storage bins so everything was organized for packing lunchboxes. I loved the idea, but wanted to tailor it a bit more for my family. I wanted every single lunchbox item in one place, including the lunchboxes. I ended up purchasing a 3-drawer medium cart from Target to create my Lunchbox Packing Station. 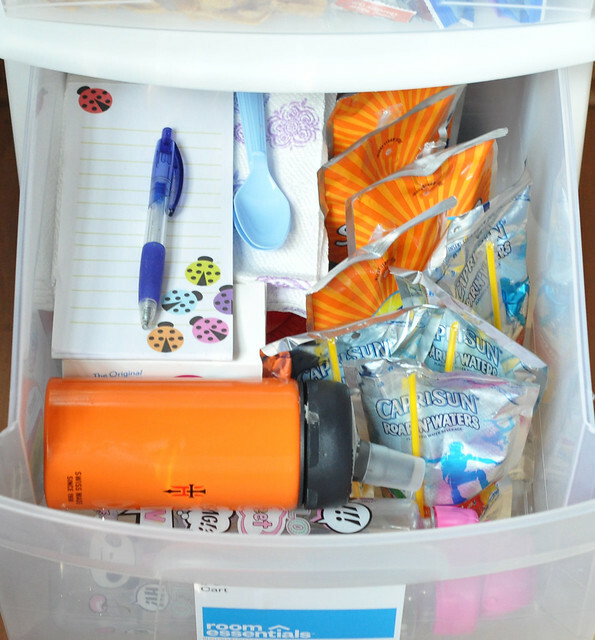 Dylan and Lexie picked out their new lunchboxes, I shopped for their favorite lunchbox items, and in just a few minutes time, our Lunchbox Packing Station was complete! What I buy varies from week to week, but the basics are consistent. 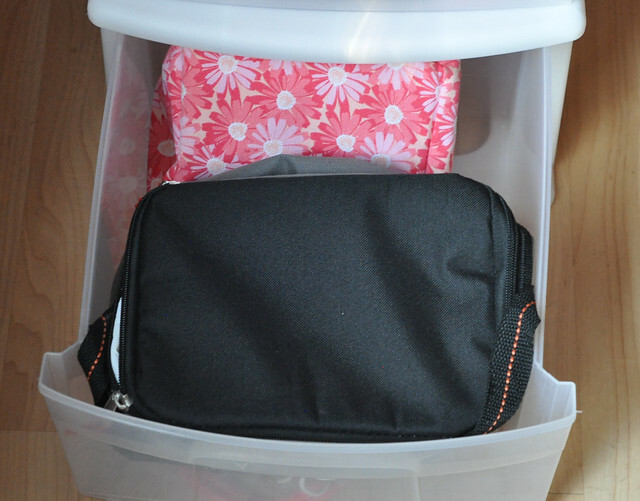 Once I collected everything I needed, I organized the items in the three drawers. Once it was finished, I placed it on top of our refrigerator. The kids can't get into the snacks, and I have easy access! 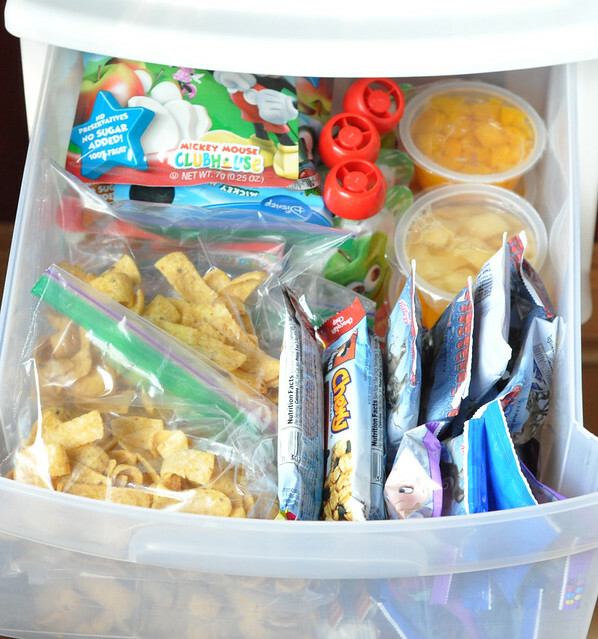 In addition to the items in the Lunchbox Packing Station, the kids always take a sandwich or a Lunchable (store bought or homemade) and I always have fresh fruit and cut up veggies in individual snack bags. I put the chips, snacks, and cut up fruit and vegetables in individual storage bags over the weekend so all the preparation is done ahead of time. 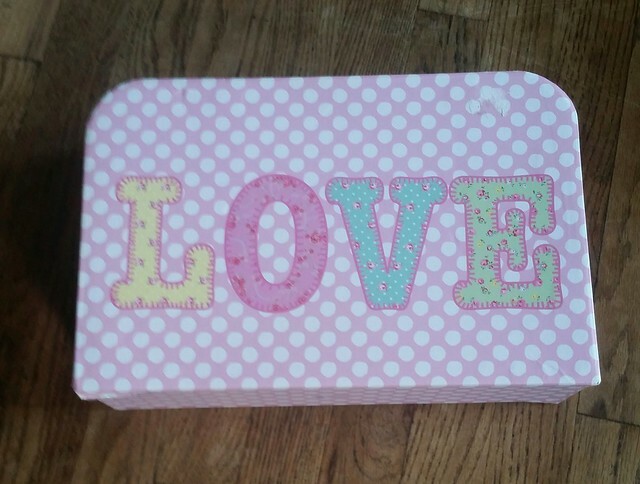 Although Dylan is too old for them, I've been putting a note in Lexie's lunchbox since her first day of 1st grade. 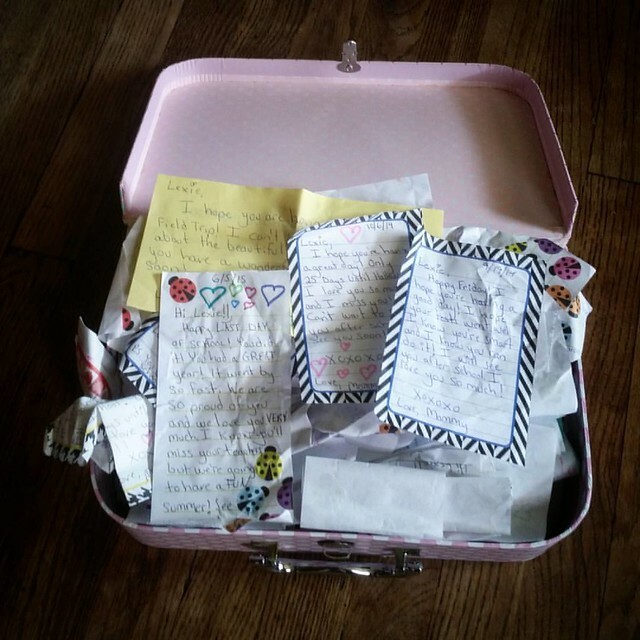 She kept every single note! I've only been packing lunches for 3 days with this new system, and it does save time! Everything I need is in one spot and I don't dread it quite as much! Anything that saves me time is much appreciated, and this is something I wish I would have done years ago. It's quick to set up and so convenient! 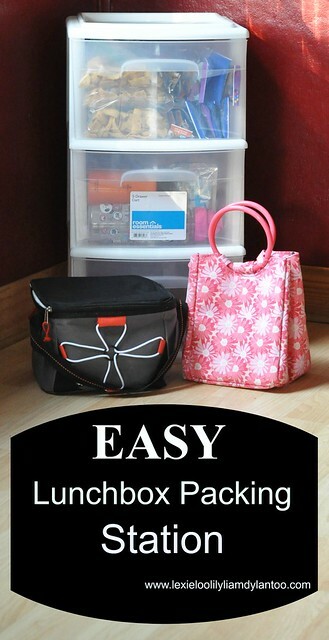 What are your favorite lunchbox packing tricks and tips? Oh my lands, those notes! I love love love that idea! How sweet! I love this idea! It makes lunchbox packing so much easier... we just had to start sending a lunch with Jacob for the first time this year, and I'm struggling getting it all together each morning! Love this idea! I only pack my own lunch right now & I hate it, haha! Such a great idea for those super busy mornings. I could see this being really helpful! That's some super mom-ing happening there! That system would be trashed at my in less than a week.